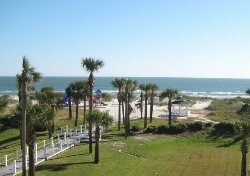 Ancient City Romance Authors' Fiction Writer's Boot Camp at the Beach 2011 was a wonderful event. We had terrific speakers, great company, awesome food, a terrific venue and everyone came home excited to get back to writing. The workshops were full of good information and inspiring ideas. The agent, Lois Winston, of Ashley Grayson Literary Agency gave a wonderful keynote address and our featured speaker, Florida author, Karen Rose, conjured up some really great workshops on Chilling Villains, Colorful Secondary Characters, and Dialog that brings your manuscript to life. Two of our own chapter put on great workshops, too. Summer Stephens gave us an insight on the new digital publishing medium and how to get it done, and Elizabeth Sinclair got us fired up with a workshop on creating great hooks in the first line, the first paragraph and throughout the book. A side trip on a Ghost Tour of old St Augustine was enjoyed by many of our participants on Friday night, as well. I could have gone along, but decided to soak in the hot tub instead which was wonderfully relaxing. Thanks to all our speakers and a wonderful supporting committee (You know who you are, but for the benefit of those who don't-- Vickie King, Dolores Wilson, Marge Smith, Kellie Sharpe and Kathy Bain)- I couldn't have done it without you. Love you all, and I can't wait for next year.